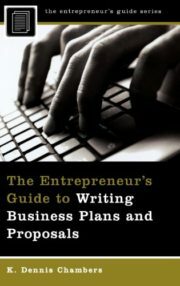 Entrepreneurs―and entrepreneurial companies―live or die by the quality of their plans and proposals. Whether it’s to get funding for a new product line or business from a client, writing hard-hitting prose that answers essential questions and makes specific requests is an indispensable skill. Entrepreneur, ad man, and writing teacher Dennis Chambers shows how entrepreneurs can persuade people, through skillful writing, to pony up capital or contracts. This ability―which can be learned―is rare in today’s media-saturated world. But it counts more than ever if an entrepreneur wants to make it over the magical five-year hump and on into lasting business success. Numerous examples and exercises ensure that entrepreneurs understand how the writing game is played―and that they play it well. Unfortunately, most don’t play this game well. Most business writers mistakenly believe their task is to inform. They write to fill an information gap or to update the reader on a particular project. Or they write about what’s important to them. What these writers do not take into account is that the speed of today’s work world has reached overdrive. The typical reader simply doesn’t have time to ponder dense, poorly organized information and intuit the appropriate action. And readers don’t give a hoot about what’s important to the writer―they want to know what’s in it for themselves. Business writers need to use all the tools at their command to persuade, inspire action, and in general move a project forward. 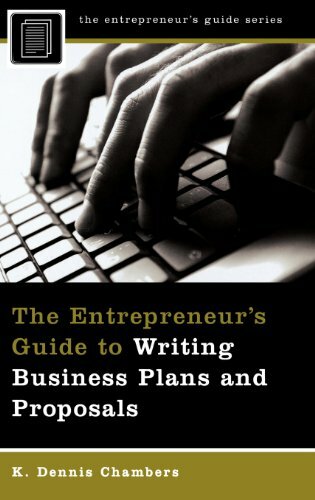 This book is about how to be persuasive in two key skills in business: writing proposals and writing business plans. Step by step, Dennis Chambers illustrates the techniques of effective business writing, with numerous examples throughout. Whether the objective is to secure financing from an investor, lay out a marketing strategy, or secure a large contract, getting results requires crafting an effective structure for the proposal, and using words that sell. Chambers is an able guide in saving entrepreneurs time and undue effort while reaching the goal of long-term business success.